After passing a very dangerous attack of meteors, the BOBULAR has to land in a planet in order to be repaired. In the planet, they meet Hermit, a lonely BOBOBOB who has been leaving there for a long time. HERMIT tells BOB WOUTER how he can leave the planet. Not realizing that HERMIT has lied to him, they leave the planet the way HERMIT told them. All of the sudden, CORNELIUS starts behaving very strange and nobody understands what’s wrong with him. Meanwhile, other strange events start happening in the BOBULAR. 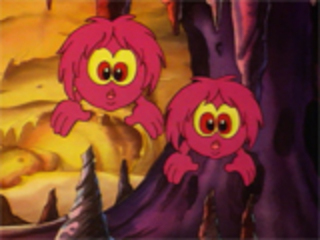 Finally, the BOBOBOBS realize that what’s actually happening is that the Demon of the Universe has taken over CORNELIUS and has used his powers to hypnotize all the BOBOBOBS. The Demon finally leaves CORNELIUS’ body and they have a fight. The Demon, using dirty tricks, almost defeats CORNELIUS but when all the BOBOBOBS think that the Demon has won, AUNT AGATHA gets rid of him in a very funny way, tickling him until he can’t resist anymore.